Regina reveals her magic formula for organizing anything, plus her method to stop the chronic cycles of clutter, misplaced items, and lateness. Whether you're living in chaos or just looking for new ways to simplify, this essential book will help you get the whole household organized--and stay that way. Don't you just hate get ting sucked in? This book has changed my life already, and I've only been following it for a couple weeks! I know that may sound dramatic, but along with Regina's support and others via teleseminar, email, and Instant Messenger, I can already feel the benefits. A very interesting plan. Extremely well written. The elimination, organizing, journaling, and dreamboarding is creating a new energy that I have not felt before. As I check off my list, I want to continue to do more. A must have for anyone!!! -additionally, the book covers getting organized while traveling, while moving, while entertaining, as well as the busy school time and holiday seasons. The Suggestions Are Brilliant -- Now How Do I Get Motivated to Start Organizing? I loved reading though this book and imagining what my life could be like if I implemented the wonderful room-by-room systems outlined here. The book made me feel as though I could really finally clean out my attic, find time to vacuum under the beds, balance my checkbook, plan ahead for meals, and recoup a large tax deduction from Goodwill after I collected and donated all my family's unused clothes, toys and knick-knacks. And I'm going to do every single one of those things -- after I start my novel and truly dedicate to flossing everyday. Unfortunately the book does not come with Dobby the House-Elf to actually perform all of these tasks, or at the very least kick me in the behind until I start doing them. But my personal shortcomings aside, this is a wonderful reference for those enterprising slobs who can actually do more than daydream about being able to start each day without digging through the laundry mountain for clean underwear and coming across that earring they lost five months ago. It did not unfortunately include a maid or a person to do the work. Finally a Great Book About Organizing! 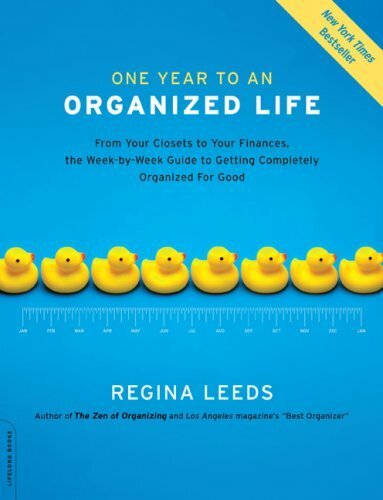 Out of all the organizing books I've read--more than I'd like to admit--Regina Leeds' "One Year to an Organized Life" stands out as the most comprehensive and inspiring book yet. The sections contain an introduction, a summary, and four chapters that correspond with the weeks in a month. Each chapter opens with a bulleted list, encouragingly titled "This week you can," followed by a time estimate for how long it takes to complete the task. The short essay at the beginning of the section introduces the "Habit of the Month," while a week-by-week summary, followed by a "Bonus tip," and "Affirmation of the Month," provides review and closure. It's been two months now since I received "One Year" and the difference in my home is evident in almost every single room. Just following the "Habit of the Month" alone can make a significant difference. While some reviewers apparently are uncomfortable about the spiritual aspect of organizing that is part and parcel of Leeds' approach, I LOVE this about the book. It's obvious that organizing is so much more than learning "tips or tricks." The perils of chaos--and the benefits of organizing--are undeniably linked to one's emotional health. If you want to get organized and treat yourself in the process, I recommend curling up with a nice cup of tea and plotting your own year to an organized life. I bought this book thinking that it would help me get more organized. It was of very little help. The author asks lots questions such as "does your home need new carpet? Should it be painted? etc. These questions are of little value. The author offers very little in the way of helpful advice. I was particularly turned off by her suggestion that people moving into a new house have a ceremony such as Feng Shui or (her favorite) use the American Indian tradition of burning a stick. She says (page 214) "Walk from room to room asking that the energies of all previous residents and their experiences leave this space. You can trace the outline of all doors and windows as a way of sealing in the good energy you are creating with this ceremony." To be honest, I didn't (couldn't) read the entire book. not finished, but loving it so far! This is the first book by Regina Leeds for me. At first I was worried that I bought it in May and not in January - "oh no!! I'm already behind!!" But after reading the forward (and you must) my fears were put to rest. You don't have to DO the month IN the month. What has worked for me so far is this: I did January first because it deals with alot of why, etc. Now I've moved on to managing paper. I enjoy hearing the personal side from the author. I, too, have a golden retriever. Enough said! I even emailed her with a question, never expecting a personal or quick response. I got both the former and the latter!! I say: Enjoy the ride, it is definitely worth the price of admission!